Comcast Corp. said it would spend $1.5 billion for control of a theme park here, expanding the U.S. media company's international operations after a deal to take over rival Time Warner Cable Inc. collapsed. In what Comcast called its biggest international investment, the cable-television giant said Monday it would buy 51% of the holding company of Universal Studios Japan from owners that include Goldman Sachs Group Inc.Comcast Chief Executive Brian Roberts said the deal would help the company's media subsidiary, NBCUniversal, close the gap with U.S. competitors, which have a head start overseas. "We had this ambition really since the beginning of our purchase of NBCUniversal," Mr. Roberts said during a news conference in Osaka, the center of Japan's second-largest metropolitan area. "We see Comcast and NBCUniversal becoming a more global company," he added. The company sharpened its focus on Asia after canceling plans to acquire Time Warner Cable for $45.2 billion in April, following objections from regulators. The theme-park business is growing rapidly in the region, especially in China. Comcast subsidiary Universal Parks & Resorts last year announced plans for a new theme park in Beijing, while Walt Disney Co. is set to open the Shanghai Disney Resort next year. Six Flags Entertainment Corp. said last year that it would build multiple Six Flags parks in China over the next decade, while Chinese property company Dalian Wanda Group Co. is establishing more than a dozen amusement parks. An influx of Chinese tourists over the past few years has helped to revive the fortunes of some of Japan's theme parks, which had slumped after the bursting of the country's economic bubble in the early 1990s ended an industry boom. 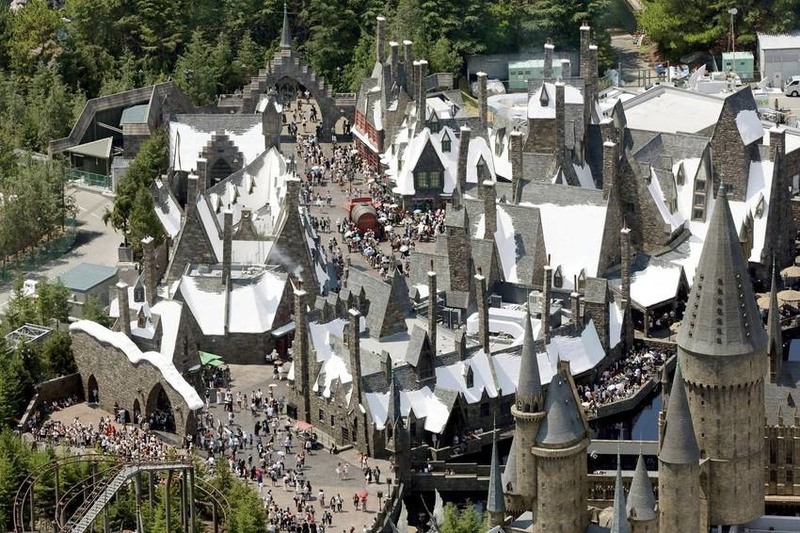 The number of foreign visitors to Universal Studios Japan has doubled since the park opened a Harry Potter-themed attraction just over a year ago, according to the company. Overall, more than 12 million people visited in the latest financial year, up from 10.5 million a year earlier. So far, the Chinese economic slowdown doesn't appear to have taken a toll on tourism to Japan. Nearly 600,000 Chinese visited Japan in August, according to the Japan National Tourism Organization, more than double the total a year earlier. Universal Studios Japan opened in 2001, and six years later the company made its debut on the Tokyo Stock Exchange's Mothers market for startups. But, struggling with declining visitor numbers, USJ was delisted in 2009, when it got a capital injection from Goldman. Goldman currently has a majority stake in USJ. Asian private-equity firms MBK Partners and PAG, along with U.S. hedge fund Owl Creek Asset Management LP, own the remainder. Under the agreement, Goldman and the other owners of USJ Co., the operator of the theme park, will sell more than half of their current stakes to a special-purpose company to be set up by NBCUniversal. The enterprise value of USJ is ¥750 billion ($6.22 billion), including debt of ¥400 billion, Comcast said. Comcast doesn't currently have a stake in USJ, although it receives fees from USJ's owners for intellectual-property licenses and other services. USJ had initially been looking to list its shares on the Tokyo Stock Exchange in September, but decided to push back the plan for an initial public offering. "Regarding an IPO, in the near term it's not happening," Mr. Roberts said, though he added that one might be considered in the future. Ankur Sahu, the co-head of Goldman's Merchant Banking division in the Asia-Pacific region, said at the news conference that the current shareholders and USJ's board decided on the sale to Comcast because they believe the deal will help secure investment in the theme park over the long term. The transaction is expected to be completed in November, Comcast said.